Phasor • PLD Space • Rock Seven • RUAG Space USA, Inc.
Phasor has experienced yet another fast-paced and exciting year. Momentum has been building, and continues to build, for the electronically steered antenna (ESA) developer. As the company looks forward to the release of its first commercial products in the first half of 2019, the company can look back on a year that has seen the company continue the transition from a technology development firm to a products company. Here’s a snapshot of some of the highlights of 2018 and a glimpse into what can be expected from Phasor during 2019. In March, Phasor opened their Technology Development Center in London, which is a world class research and development facility. This center hosts the design, development and testing of Phasor’s current and next-generation connectivity technologies tailored to commercial SATCOM mobility markets, including high-speed broadband for maritime, aviation, and land-based vehicles. The opening of the center marked an important milestone in the evolution of Phasor as a company and allowed for the expansion of facilities and staff. In addition to the opening of the Technology Center, Phasor appointed senior executives that are leading critical areas of Phasor’s global operations, from engineering to business development and supply chain management. Phasor boasts a growing team of technology and engineering professionals. Phasor also secured various major commercial product contracts over the past year, valued today at more than $300 million. These agreements underscore the company’s maturation, demonstrate successful early commercial engagement and underscore the latent demand for innovative access technology in commercial mobile broadband markets and the analogous unmet need in government Communications-On-The-Move (COTM) markets, for enterprise-grade connectivity on land, sea and in the air. Technologically, Phasor has enjoyed a vibrant 2018. With the commercial product launch slated for the near future, the development of the ESA systems for land-mobile, maritime and aeronautical applications is moving into a new phase. There have been some notable milestones and partnerships in 2018. March brought the signing of a partnership agreement between Phasor and Spanish satellite operator Hispasat in order to address rising connectivity demand for professional and passenger land vehicles in its geographical markets, such as Intercity buses. Phasor is collaborating with Hispasat on the development of a Ku-band ESA that will be tailored to the unique requirements of land-mobility applications, using the same core technology found in Phasor’s commercial maritime and aeronautical ESA solutions. Drivers and passengers in buses, trucks and emergency or municipal vehicles, will be able to enjoy a high-quality connected travel experience for applications like operational telematics, and passenger Internet access, mobile telephone services, and even entertainment services on board. The ESA system is expected to be available within two years. Related to the LEO market, in March, Phasor announced a strategic agreement with LeoSat who will launch a laser-linked constellation comprised of as many as 108 LEO communications satellites to provide gigabit-per-second connectivity speed to the enterprise market. The agreement in place is set to serve a broad range of mission-critical enterprise network markets with an ultra-high throughput, low latency network infrastructure solution. As part of the alliance, Phasor will accelerate development of a Ka-band variant of its Ku-band ESA nearing commercial launch. This powerful Ka-band, NGSO –ready version of its ESA will be scalable to virtually any use-case requirement. Phasor’s LEO-capable antenna technology will enable corporations, governments and other mission-critical, high bandwidth users to access a network offering speeds about 1.5 times faster than terrestrial fiber in combination with high-throughput, ultra-security and very low latency. The engagement of Phasor is significant as it is an important step in the delivery of LeoSat’s services and underlines the importance of the correct kind of access technology. In June, Phasor entered into a commercial partnership with Astronics AeroSat. The companies are working together to produce scalable, dual-beam ESA-based aeronautical terminals, which will enhance the passenger and crew experience aboard connected business and commercial airlines. 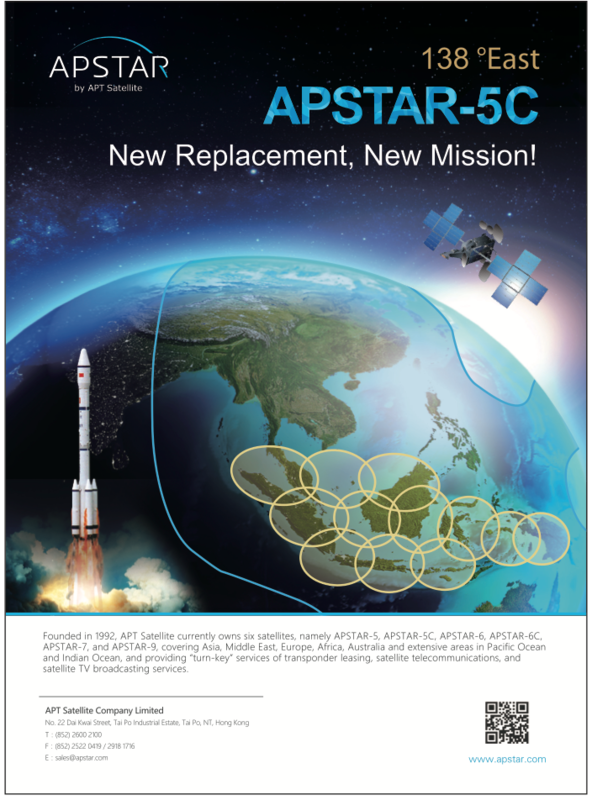 Astronics AeroSat will integrate Phasor’s phased-array technology into an agile aviation antenna solution that will operate seamlessly with Geostationary (GEO) and Non-Geosynchronous satellites, such as the Low Earth Orbit (LEO) wideband constellations that are currently in development. The new antenna will feature dual-beam technology with a “make-before-break” capability. The two companies will pursue and achieve certification and commercialization of the new dual-beam terminal across multiple commercial airframes and satellite communications networks, coupling Phasor’s innovation with best-in-class avionics and terminal integration expertise. In September, Kepler’s first wideband LEO satellite, KIPP, was successfully auto-acquired, auto-tracked and communicated with, via Phasor’s ESA. This was a highly anticipated milestone as this was the first time that a commercial, flat-panel, electronically steerable antenna had achieved such a feat. Phasor’s antenna successfully acquired, tracked and received transmissions from KIPP as the satellite passed over Phasor’s test range facility in the UK. For the test, Phasor’s antenna was able to track KIPP for its entire pass down to 20 degree elevation angle, demonstrating the viability of the 70 degrees scan angle available from the Phasor electronically-steerable antenna. That achievement now opens the door to a wide range of novel applications that can benefit from phased array antenna technology, which the duo intend to address. The combined capabilities of Kepler’s ultra-low-cost satellites and Phasor’s high-performance technology will allow the potential of high-speed LEO Ku-band mobile connectivity to be unleashed. Customers will be able to benefit from the ability to dynamically and seamlessly switch between satellite networks in order to optimize traffic management. This marks another exciting beginning on Phasor’s journey into the commercial market and to the prospect of bringing real capabilities to markets such as maritime, transportation, natural resources, IoT and other on-the-move applications. 2018 was a busy year for the firm and the Phasor team is looking forward to launching the company’s initial products into the market during 2019. Currently being worked by Phasor is the company’s land mobile and maritime system, with field tests underway for the first release of products. Longer-term, Phasor’s Product Roadmap includes a three-release strategy over several years, covering a range of form-factors, use-cases and frequency bands. The year ahead promises to be an exciting and significant one as Phasor introduces its highly-anticipated technology to the market. The company is dedicated to making its breakthrough ESA available to the wide spectrum of mobile applications, enabling a level of connectivity that is transformative, delivering seamless, high performance connectivity — the future of mobile broadband. David Helfgott has the responsibility for the company’s strategic direction, to drive the development of the firm’s Electronically Steerable Antenna (ESA) products and technology and to implement its operational programs. As a 20 year industry veteran, he has extensive experience in satellite broadband, mobile telecommunications as well as commercial and government SATCOM networking services. Mr. Helfgott has held leadership positions at Inmarsat, Cobham, DataPath and SES. He holds a BA Degree from the University of Virginia and an MBA from the Darden School. Phasor’s electronically steerable antennas (ESAs) are based on patented innovations in dynamic beamforming technologies and system architecture. Phasor’s mission is to enable high-speed broadband communications while in-flight, at sea or traveling over land. PLD Space is a company based in Elche, Spain, and was founded in 2011 by Raúl Torres and Raúl Verdú. Sensing a need in the market for small satellite launch providers, both entrepreneurs founded PLD Space with the purpose of offering dedicated commercial launch services for smallsats. With more than 50 employees on staff, and 13,000 square meters of space for the development of rocket engines at Teruel Airport, the company has set the countdown for the launch of MIURA 1, a suborbital vehicle designed to launch technologies and experiments requiring space-like conditions. Since inception, the company has received private and public funding that, today, exceeds 18 million euros. The project has the support of large institutions such as the European Space Agency (ESA), the European Commission, the Center for Industrial Technological Development (CDTI), the National Institute for Aerospace Technology (INTA), ENISA, IVF, Suma Teruel, the UMH Science Park and more than 25 private investors and aerospace companies. With this economic support and the daily work of a team of professionals, PLD Space is today one of the most promising European companies in its market segment. Artistic rendition of the MIURA-1 in flight. Image is courtesy of PLD Space. 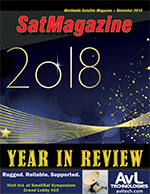 2018 has been especially important for the history of the company. 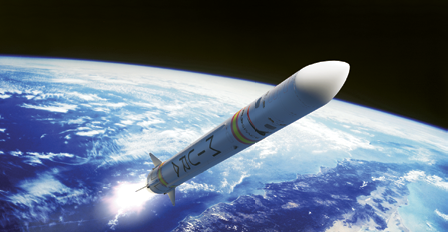 In January, PLD Space received a two million euros grant from the European Commission for the MIURA (previously known as ARION) microlauncher program. This honor has been awarded through the Small and Medium-sized Enterprises (SME) instrument Phase 2, a part of the European Union’s Horizon 2020 Program for Research and Innovation. With this financial support, part of the rocket structure is currently being developed. MIURA 1, the first liquid propulsion suborbital microlauncher in the history of Spain, is already in the manufacturing and assembly phase. The first launch, from the El Arenosillo Experimentation Center, belonging to INTA, is scheduled for the third quarter of 2019. This launch will enable in-flight validation of many of the technologies that will be used on the MIURA 5, one of the few rockets in the world dedicated to the smallsats launch industry. The engine testing is another important step that is being carried out in Teruel Airport, with whom PLD Space has signed a 25-year concession for rocket engine testing. Additionally, this year important companies, such as DLR, have used the PLD Space test facilities for their engine development and have produced some great results. PLD’s ability to cooperate with other companies has been a vital advantage in entering the private launch industry, not only in the use of the facilities, but also in the construction, launch and recovery of the microlauncher. PLD Space and ZARM have signed a Launch Agreement for the test flight of MIURA 1, becoming the first customer flying onboard the rocket next 2019. Furthermore, the world’s leading manufacturer for world class launch vehicles, RUAG, will provide MIURA 1 and MIURA 5 with the fairing, one of the most critical structures of the microlauncher. RUAG has designed the fairings for European ARIANE 5 and VEGA and United Launch Alliance’s ATLAS V.
Recently, PLD Space made public how the recovery system will work for the first European recoverable microlauncher. Thanks to the airborne systems technology, MIURA 1 and the first stage of MIURA 5 will be recoverable. In conjunction with PLD Space’s proprietary technologies for re-entry, MIURA 1 will use a combination of two different types of airborne system parachutes, a drogue parachute and a main parachute. The Drogue parachute is a 3 meter parachute with decades of heritage. This technology was used as part of the Space Shuttle Orbiter landing deceleration system, the NASA Orion Earth Landing System and some Commercial Crew Capsules developed by U.S. space companies. In addition, PLD Space is using a 15.3 meter diameter, quarter spherical, polyconical parachute, designed for the Air Force Security Assistance Training (AFSAT) platform in response to a requirement for an extremely stable, drag efficient, lightweight and reusable parachute. Parallel to this, PLD Space will continue working with Airborne Systems in the development and testing — that will be carried next April 2019 — of the recovery system to be used on MIURA 5 first stage demonstrator. In regard to future development, the Spanish company has also presented the new configuration of MIURA 5 at the ESA Microlaunchers Workshop. PLD Space’s orbital microlauncher will have two stages. The first stage will contain five engines and 408 kN of thrust, while the second stage will have one engine capable of 68 kN of thrust. Both engines and stages will be developed by PLD Space, while the avionics will be developed jointly with GMV. The vehicle diameter will be 1.6 meters, with a first stage length of 17 meters and a second stage length of 6 meters. The fairing will be 3.2 meters in length. MIURA 5 will be 32 tons at lift-off; the vehicle is designed to be small enough to provide dedicated launch services to smallsats. Looking toward 2019, PLD Space is working against the clock to become a keystone provider in the technological and social development of Spain. The company will help the expansion of the small satellites market in Europe, while undoubtedly the institutional and financial support and the daily effort of a team of professionals are key factors for the success of this important project. As 2018 winds down, the most encouraging development in Rock Seven’s ongoing expansion is the company’s recent acquisition by the Machine-to-Machine (M2M) and Internet of Things (IoT) provider Wireless Innovation. This is a mutually advantageous arrangement. Rock Seven’s technical experience and expertise in the field of Iridium-based satellite tracking systems will reinforce and broaden Wireless Innovation’s product and services platform. By the same token, belonging to a larger concern will open up a whole new layer of developmental and commercial opportunities for Rock Seven – and the long-term significance of this cannot be underestimated. This has been a promising year for collaborations, with the announcement in June of Rock Seven’s new partnerships with Blue Sky Network and Network Innovations. The California-based Blue Sky Network, a key supplier of communication and satellite tracking solutions, has created a stir with their cloud-based SkyRouter fleet management and analytics portal: the alliance with Rock Seven has brought about the successful integration of SkyRouter into Rock Seven’s standalone, dual-mode Iridium/GSM RockFLEET tracker. Other items from Rock Seven’s product portfolio also address the varying needs of Blue Sky Network’s customer base: the RockAIR dual-mode tracking device, the RockBLOCK two-way IoT satellite communications system and the RockSTAR handheld two-way messenger. Rock Seven’s partnership with Network Innovations Inc., meanwhile, has seen the incorporation of RockAIR, RockFLEET, RockSTAR and RockBLOCK products into a flexible suite of tracking and IoT solutions as the company moves into IoT applications in the aviation, maritime, government and land mobile sectors. By implementing Rock Seven’s highly configurable hardware platforms, Network Innovations can rapidly deliver complete IoT solutions to its clients, generating substantial Return on Investment (RoI) and promoting customer value. Regarding the RockAIR flight tracker, Rock Seven’s year began on a positive note with the news in January that the United States Fire Service (USFS) had approved RockAIR for use in its airborne firefighting operations. The carry-on, carry-off RockAIR — uniquely designed for easy dashboard or windscreen mounting in light aircraft and land vehicles — has quickly accrued an unassailable reputation as the most compact, cost-effective and conformable dual-mode solution for satcom and cellular connectivity. With its integrated back-up battery for safety and security, which automatically cuts in if the 9-30V DC or Micro USB power should fail for any reason, RockAIR defaults to economical GSM tracking when in cellular range, but switches to the strongest, most practical (and least costly) Iridium satellite network in more remote areas. In July, the company announced involvement with the BESPIN and HAPP projects, both of which require Rock Seven hardware to collate and transmit space exploration telemetry. The BESPIN (Balloon Ejection Student Prototype Investigation) project was devised by an international group of students from the Luleå University of Technology in Sweden. The experimental project aims to pre-emptively assess the feasibility of a balloon-assisted, manned mission to investigate the upper atmosphere of Venus. A research rocket is due to be launched in March of 2019 that contains a Free-Falling Unit (FFU) which will be ejected from the rocket’s nose cone at the mission’s 80 km. apogee. The FFU consists of a flotation probe and a descent probe: it will freefall to an altitude of approximately 5 km., whereupon a parachute will open on the descent probe. Thereafter, a Rock Seven RockBLOCK will be used to convey operational and location data to a ground station. Meanwhile, the HAPP (High Altitude Photography Platform) project, conceived by engineers Christopher Couch and James Mayes, is a pioneering incentive involving a jet-stabilized aircraft and balloon system designed to capture stabilized, 360 degree high-altitude video. Rock Seven’s RockBLOCK is again an integral ingredient: the HAPP craft can drift by up to 100 km. in the course of a mission, but a RockBLOCK successfully relayed stable telemetry and system sensor data from the flight control computer on the craft’s maiden flight. The U-Blox board and PCBs were open to the atmosphere throughout, with the craft flying at an altitude of up to 22 km. : this exposed the components to temperatures ranging from +42°C to -45°C, as well as pressures from 1atm down to 0.05atm. Rock Seven hardware was also at the heart of the MIRKA2-RX mission, completed in October of 2018, which was formulated by students from the University of Stuttgart’s Small Satellite Group to field-test technology for use in a future cubesat endeavour. The mission rocket included a micro re-entry capsule (MRC) which was ejected into the upper atmosphere, subsequently landing in the harsh, snowy terrain of the Swedish Alpine tundra. The mission team were able to locate the MRC thanks to telemetry received, via Rock Seven’s API and server, from the RockBLOCK-hosted 9603(N) modem and antenna in the device. Monitors set-up: ForestLink hardware in Cameroon. Returning to more earthbound concerns, Rock Seven occupied a pivotal role in critical and timely environmental projects throughout 2018. In September, the company reported on The Ocean Cleanup, a resourceful but economical solution to tackle plastic pollution in the world’s oceans. Each system uses a 600 meter long, U-shaped floater with a 3 meter deep skirt beneath it: the curved floater is carried along the ocean surface, at a slightly faster speed than the current, by wind and wave energy, collecting plastic refuse as it goes. During the research stages, Rock Seven’s 9603 RockBLOCKs have been fitted to a number of drifting, open-source ‘marker buoys’ intended to simulate the movement of plastic particles around the systems. Data accumulated via the RockBLOCKs has proved invaluable, and the Ocean Cleanup foundation anticipates being able to clean up to half of the so-called Great Pacific Garbage Patch in five years. September 2018 also saw Rock Seven detailing its involvement with Rainforest Foundation UK, helping to curb illegal extraction activities in the Congo Basin and the Amazon. The foundation’s ForestLink real-time monitoring system relies on monitors living in the rainforest to report on suspected illegalities via a bespoke smartphone app: if GPRS isn’t available, ForestLink uses Rock Seven’s RockBLOCK and weatherproofed RockBLOCK+ devices to transmit data. Thousands of alerts have already been sent, prompting legal action and protecting millions of hectares of rainforest. Also worthy of note is that the RockBLOCK 9603 is at the heart of the Cryologger, a multi-purpose research datalogger and telemeter developed by the Water and Ice Research Laboratory (WIRL) at Carleton University, Canada. The Cryologger gathers aquatic and cryospheric data relating to the drift patterns of icebergs as a means of achieving a fuller understanding of the effects of rapid climate change. Speaking of the future, there’s a wealth of exciting opportunities ahead for Rock Seven customers with the advent of the higher-bandwidth Iridium NEXT constellation and Iridium Certus, the new NEXT-based L-band broadband platform for web browsing, email and voice calls, which is on course to deliver a speed of 1.4 Mbps. Rock Seven offers competitively-priced pay-as-you-go or fixed-price Iridium contracts. The Iridium SBD (Short Burst Data)-based RockBLOCK supplies sterling service, as amply demonstrated by diverse users, but it is fully compatible with Iridium NEXT, as are Rock Seven’s RockFLEET, RockAIR and RockSTAR, so the company’s products can continue to be integrated into IoT devices and support global mission-critical applications as the potential of satellite broadband communications evolves. In a world of speculation, Rock Seven’s products and services provide certainties. Lower cost and increased flexibility are more than just buzz words in today’s new space environment — these are requirements that the industry is demanding. And while changes in an already successful production process can seem intrusive, RUAG Space has actually found its niche. One particular area wherein RUAG Space has evolved as an industry leader is the process for manufacturing carbon-fiber based satellite structures. RUAG Space has automated the production process which benefits the firm’s satellite customers. The key element of this advanced process is the Automated Potting Machine (APM). RUAG’s Automated Potting Machine (APM). The APM was born out of a need for innovative manufacturing processes to address the new space market. It uses a Computer Numerical Control (CNC) machine to position special inserts filled with adhesive into the satellite structure’s sandwich panels. The inserts allow customers to firmly attach equipment, instruments and/or sensors to the satellite structures. A typical communications satellite has as many as 5,000 such inserts and, up until now, the aerospace industry has always positioned inserts by hand — a process that is quite time consuming. The APM, along with RUAG’s patented insert, can place up to 15,000 inserts per day, reducing the lead time on satellite panel production down to one day. Plus, RUAG Space now has two of these machines in the company’s Titusville, Florida, facility — where satellite structures are manufactured for OneWeb. The bottom line in terms of speed? RUAG’s automated manufacturing process for satellite panels lowers throughput time, significantly reduces cost and raises the quality for the firm’s customers with precision insert placement. Also provided is an increase in flexibility whereby customers can modify insert patterns later in the process, lessening the need for compound glue additives — less time, less weight, less money. Another prime example of lower cost and more flexibility lies within the manufacturing process of the company’s payload fairings. RUAG Space has a long history of fairing production for customers in Europe and the U.S. — with a 100 percent mission success rate — a heritage that has made RUAG Space a global leader in carbon structures for launch vehicles. However, in order for customers to continue to meet industry demands, RUAG Space has focused efforts on making access to space more affordable, becoming one of the pioneers in the Out of Autoclave production process. In 2016, RUAG opened a new state of the art production facility in Emmen, Switzerland. It was here that RUAG inaugurated the new process that used an industrial oven instead of an autoclave, allowing the massive carbon fiber components — which constitute one half shell of the payload fairing — to be economically produced in a single piece. The ambient pressure of the oven hardens the composite structures, as opposed to the autoclave process of excess internal pressure, and the cost savings from such an industrial oven enabled the company to go bigger. A bigger oven means bigger products. Fairing demolding in RUAG Space USA’s Decatur, Alabama, facility. Photo is courtesy of the company. Entire half-shell fairing sections can be cured at a time, eliminating costly and time consuming vertical integration of numerous shell elements. The new process reduces throughput time by 50 percent and enables RUAG to increase the delivery volume and sequence for payload fairings. Other major elements in the process, such as the laser-assisted layering, the completely automatic nondestructive testing and the ergonomic horizontal integration station, all contribute to the new, leaner, faster, better process that RUAG Space is best known for implementing. The first RUAG Space Out of Autoclave fairing made its successful debut in June of 2017 on an Ariane launch, and the Vega fairings flew next. In the U.S., RUAG Space is now manufacturing Atlas V-500 fairings for United Launch Alliance in Decatur, Alabama. 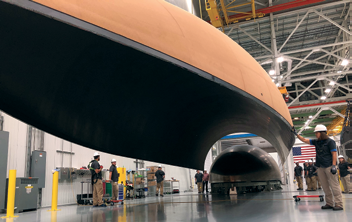 Earlier this year, RUAG Space completed the bonding and curing of its first U.S.-made Atlas V-500 demonstrator fairing, and full production of its first flight hardware fairing will begin in 2018. The ability to have these lean, Out of Autoclave processes on both sides of the ocean provide even more cost savings to U.S. customers as well as in Europe, avoiding costly transportation fees. This is representative of RUAG’s dedication to meeting new space demands, and willingness to be in close proximity to customers. At RUAG Space, diverse product portfolios gives the firm a strategic market advantage. For example, in an effort to meet the needs of the customer in terms of performance and cost, RUAG Space is making use of standard components for on-board satellite and launcher computers. By using Commercial-Off-The-Shelf (COTS) electronic components and qualifying them for space — rather than expensive, specifically designed for space components, RUAG Space is bringing lower-cost options to the space industry. The use of COTS components generates 10 times the performance, reduces the lead time by a multiplier of 20, and costs 50 times less to build. RUAG’s willingness to innovate and grow within the new space environment does not just begin, nor end, with APM, fairing production, and other advancements. 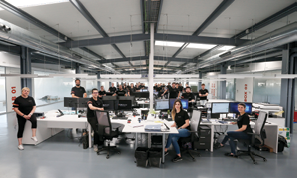 It is the culture of RUAG Space, led by Chief Executive Officer Peter Guggenbach and it extends to all product groups within RUAG Space, whether mechanical or electronics products, whether for launchers or for spacecraft. Examples can be found across all product groups of RUAG Space on how innovative thinking and the improvement in processes is second nature to the company’s culture. This is what keeps the firm’s customers at the top of the market and is what enables the company to meet the demands of today’s global industry. This is RUAG Space.